We continue the newest feature here on Rewards Canada, Earning Stories. For years we have provided you with the details on earning points and miles (both regular earning and bonus opportunities) but we haven't really shown those actual offers in action. That is where Earning Stories comes in. We are showing you the actual earning process and how valuable these earning opportunities can be. The Earn Away Get Away promotion was Starwood Preferred Guest's recent systemwide promotion and since our stay included a Sunday night we earned the Triple Starpoints on the entire stay. 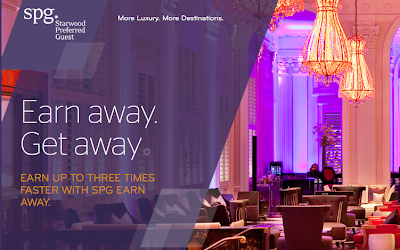 Even more points were earned as I hold Starwood Gold Elite Status, a 50% bonus on the base points plus I choose the 250 Starpoints SPG Gold amenity over the free drink at the bar. If you don't stay frequently enough at Starwood Hotels to earn Elite Status you can also get it with the Starwood Preferred Guest American Express Card (when you spend $30,000 in a year) or automatically with The Platinum Card from American Express to get the elite bonuses. Overall the stay earned 7,280 Starpoints which are enough points for a standard room free night award at a Category 3 Hotel or for a cash+points redemption at a Category 5 Hotel. Since I don't have any SPG award nights planned at this time these points are going to be held in my account for the time being. 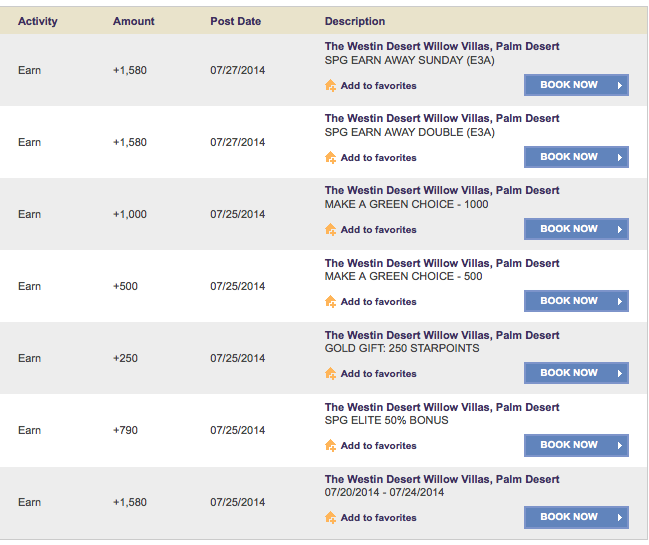 As you can see by registering and taking advantage of this bonus offer along with the Go Green option, we earned quite a few Starpoints on a stay that we were going to do no matter what! Everyday people have stays like this that are not earning any bonus points or even in some cases no points at all since the people aren't part of the hotel's program! We cannot reiterate enough that not only should you join a hotel program to earn points (or airline miles) but always register for bonus point promotions even if you think that you may not use it.